Note: All lessons are recorded with manual text entry for any measured values, for stairs the procedure is the same when using a Laser Measurement Device, but please refer to Topic 3a – Lessons 2 and 4 for measurement specific information. There are some operational differences when using a Total Station for stairs, which are a type of symbol refer to Topic 5 – Lesson 2 for additional information. The ‘Add Stairs’ tool is available for rooms that have been closed/ended, due to the input of required level information. There are various ways to record stairs in Floor Plans depending on their design, two stairs are worked through in this topic as examples. A stair can be made up of one component, i.e. 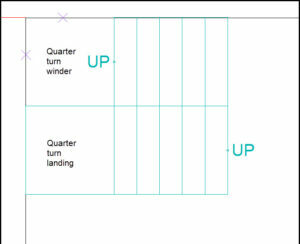 a straight flight or several components, for example a winder, landing and straight flight. Each component needs to be treated separately to be drawn correctly in Floor Plans. Depending on the situation the components can be drawn using the Stair, Symbol or Beam Tools. 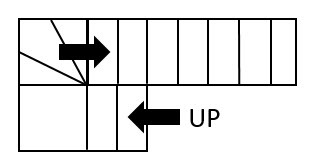 Straight flights of stair section or landings are drawn using the Stair tool. 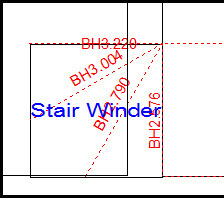 or PNT symbols to mark where the winder riser meets the wall of the stair so the winder risers can be drawn in the CAD software. Although it should be noted beams can also be used to draw a winder, especially if you can get underneath the winder. Using Beams for winders is more cumbersome, but it provides a more complete drawing in Floor Plans. Refer to Topic 8 – Lesson 2: Adding a non-perpendicular beam. For spiral, sweeping stair cases or any curved object it is recommended a Total Station is used to survey the edges as a room in Floor Plans on the appropriate layer, for example stairs. Enabling the line work to be created in the CAD software. Topic 7 – Lesson 1: Adding straight stairs, a landing section and editing using the Stair tool.